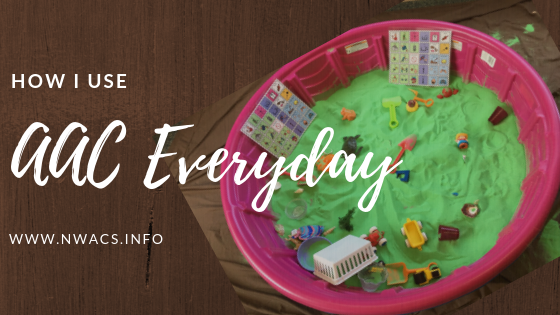 This is an expansion post, companion to a prior post (How I Use AAC Every Day) which shares some basic tips and tools for using AAC strategies to support a wide range of communicators, from non-verbal to verbal, and those in between. In this post, I’ll focus on rationale for ongoing use of AAC tips and tools to maximize the total communication skills of emerging - or limited - verbal communicators. First, let’s address the “easy” myth: that AAC use hinders speech development. Research has shown that AAC use does not hinder speech development, and in fact - in many cases - AAC actually improves verbal outcomes. But what about this idea that once the individual can speak to some degree AAC is no longer needed? The truth is that many - if not all - of the emerging verbal communicators I have in mind here - regardless of age, diagnosis, or otherwise - do not possess the verbal skills required to be independent communicators (i.e., to say what they want, when they want, to whomever they want). Furthermore, many of these emerging or limited verbal communicators struggle with language learning challenges that may most appropriately be supported by ongoing use of visual strategies - if not for expression, then at the very least to support the language learning process. Is it possible (or perhaps likely) that in taking away these visual language supports too soon, we are not only hindering the language learning process, but also removing a valuable (perhaps essential) element of an individual’s total communication system used to assist them in navigating and repairing communication breakdowns? I love using AAC strategies for all types of communicators (including verbal ones) to teach new words, how to combine words in new ways, and which words to use for new communication contexts and functions (e.g., to ask for what you want during a meal or playtime, tell someone what you think, ask a question about a new experience). I have learned how valuable this strategy of aided language modeling is for verbal communicators who may be limited in their ability to communicate with a wide range of partners in a wide range of contexts given the emerging nature of their verbal skills and/or limited intelligibility (due to speech production differences or language differences, such as echolalia). When supporting a child with extensive use of echolalia - for example - my AAC tools don't necessarily act as a "voice", but rather a systematic way for this communicator with language processing differences to process the verbal information floating around in space. AAC becomes a tool to help break down these “chunks” of language into component parts, which helps communicators with high use of echolalia develop more generative language (versus scripted language) over time. For these communicators, AAC models also help them process the meaning of new words and visualize how tagging on a seemingly little word like "not" (for example) to a word within his/her verbal repertoire, can make a big change to the overall message. Over time, I can use AAC tools with these communicators to provide the contextual cues they may need to retrieve the verbal language within their repertoire that is relevant in a given situation. I use a range of AAC supports to emphasize key words in verbal dialogue and directions to support communicators who struggle to focus on what is most important in a more complicated message. These communicators may process just a few pieces of information from a complex message and usually process the piece or pieces at the end of the message. Paired with crafted, well-paced verbal messages, using AAC to emphasize key words can help these communicators know what to tune in to and give them one more modality to assist processing. And we all know how important the visual modality is in the language learning process for so many of our kids! I work frequently with children who experience a spectrum of challenges with motor planning for speech. Many of these children are quite motivated to verbally communicate, but often hit hurdles with intelligibility. The high occurrence of communication breakdowns for verbal children with significant motor-speech challenges can cause much frustration and negatively impact the success of communication interactions, further hindering language and social development. AAC is an essential means of augmenting/supplementing the approximate verbal communication of these individuals. They benefit from the same level of aided language modeling warranted for any AAC learner, as well as distinct teaching on the process of recognizing when a partner has not received their verbal message. Teaching communication repair strategies by helping communicators with limited intelligibility problem solve through these breakdowns using AAC can increase their overall comprehensibility and reduce frustration over time. How do you use AAC with your verbal communicators? Valenzuela, Cynthia, "Effects of an augmentative and alternative device on echolalia in autism" (2013). ETD Collection for University of Texas, El Paso. AAI1540153. The Center for AAC and Autism: Why AAC?